IM RAISING A CHILD THAT ISNT MINE. THIS MORNING I GET A TE - ProudMummy.com the Web's Community for Mums. I'M RAISING A CHILD THAT ISN'T MINE. THIS MORNING I GET A TEXT FROM HER BIO MOM: "YOU'LL NEVER BE HER REAL MOM." 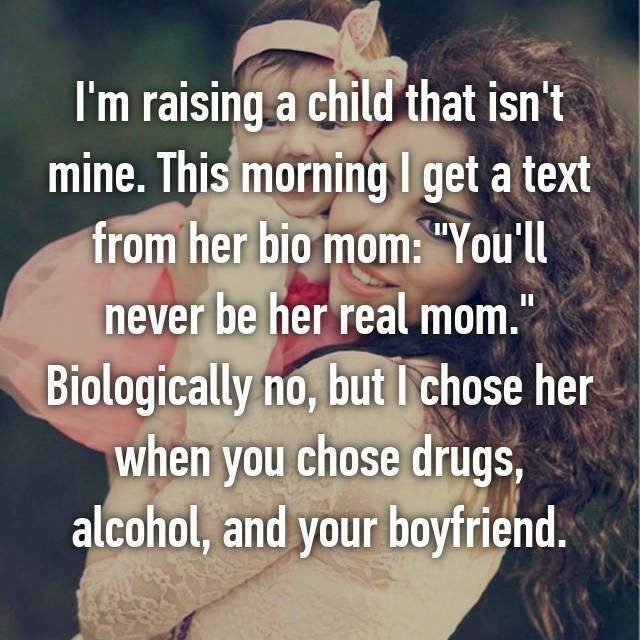 BIOLOGICALLY NO, BUT I CHOSE HER WHEN YOU CHOSE DRUGS, ALCOHOL, AND YOUR BOYFRIEND. I have great respect to people who actually love and take great care of kids that aren’t theirs, adoptive parents are the most beautiful and wonderful people out there. That's a very bias opinion. No one knows everyone's story. (Coming from someone who has fostered kids). The person who brings a child up is their mum or dad. Biology is irrelevant. TRUE WORDS THERE!!!!!!! respect to anyone looking after someone elses child!!! Nobody's perfect but your children come first before anything in life!!! Mick Edwards Martine Williams saw this!! Whilst I agree with this somewhat, it's all too easy for people on the outside to say people chose addiction over their child. Many didn't choose it. Ok there are some good foster and adoptive parents. There are also some people who could be great biological parents who aren't always given the support they need due to the postcode lottery of specialist services and that isn't the fault of people in difficulty. YES...been there, done it 4 times. Shurrup and get off Facebook.